Middle daughter was home this weekend to celebrate her birthday. The actual date was almost a month ago but with her work travel schedule she wasn’t able to come home until this weekend. It’s always good to have her home and the other kids came and joined us for dinner. We had great conversations about jobs, activities and QR codes. If you don’t know what a QR code is, it’s the little box with squares that you find on advertising that can be read with a smart phone. This link will give you more information about a product or take you to a web site with more information. After a yummy dinner she opened her gifts. 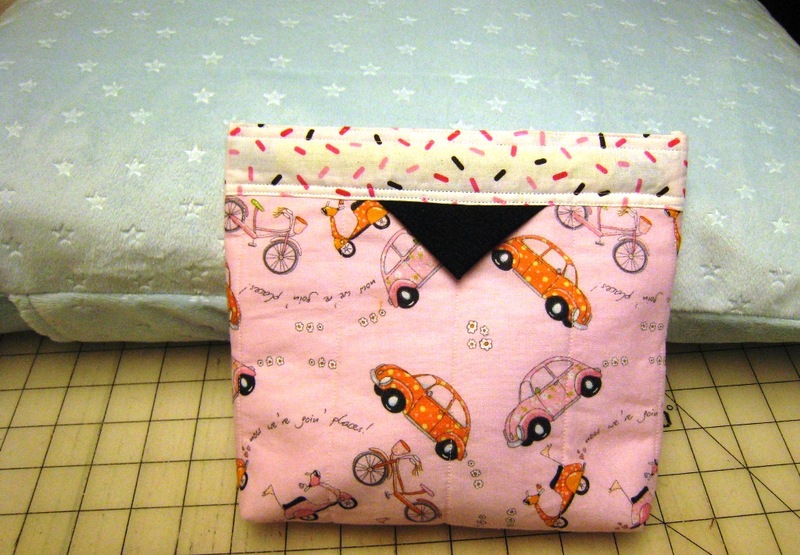 I had to do some sewing of course so she got this little snap pouch and a covered pillow for her bed. After looking at the pictures I wish I had thought about design placement on the fabric before I cut it but I only had a small piece and not much flexibility as to where the pattern was on the fabric. 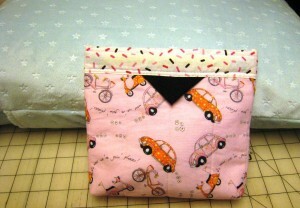 It is cute however and because she is a transportation planner it seemed appropriate. She also lives in a studio apartment so her bed is a focal point and she has started a pillow collection on her bed. This one I used some really soft cuddle fabric and made a slip cover for it so she could use it as a decorative element or it could be used for guests and still look not so bed like when it’s not being used for sleeping. All in all, another successful weekend.